Traveling to the city of Lianzhou is not easy: it is at least four hours' drive from the nearest airport in Guangzhou, capital of Guangdong Province. And unlike the ancient world-heritage city of Pingyao - which also hosts an annual international photography festival - it remains remote and unlovely. 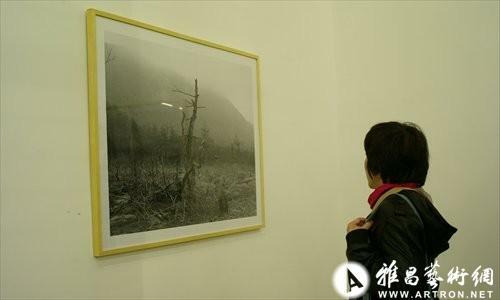 But that doesn't stop hundreds of enthusiastic photography lovers gathering here each year to attend the Lianzhou International Photography Festival (LIPF) and enjoy the some of the most avant-garde photography from around the world to be shown in China. Themed "Toward the Social Landscape" by curator Fei Dawei, this year's event opened Saturday and, as usual, it has the small and otherwise unremarkable South China city in a giddy atmosphere of art and excitement: I found the city plastered with posters for the festival. Visitors from across the country, together with foreign artists and audience members, mingled with locals, carefully observing the exhibits and getting into the spirit of the festival with their own elaborate and expensive photography gear. It's hard to get a room without a reservation, even though several new starred hotels have been built recently to accommodate this burgeoning tourism. Scheduled to run until December 8, LIPF showcases some 70 photographers' works, among which about 20 are from countries such as Canada and the US, while many others are young Chinese photographers born in the 1970s or 1980s. As in Pingyao, which showcases its festival in former diesel-engine factory spaces, the show is spread across three former industrial locations, a shoe factory, candy factory and an old granary that were deserted for decades up until the LIPF began in 2005. With local government support to make it an internationally-renowned photography venue, all the deserted factories were rebuilt to become perfect places for displaying works of art. Now in its seventh year, the festival has grown into a major fixture in China, and what make it different from the now world-famous Pingyao festival is that Lianzhou still tries hard to keep a sharp eye on selecting young photographers, while its concepts are much more avant-garde. Although "Toward the Social Landscape" sounds documentary-like - and, indeed, this year's LIPF focuses on social reality - the festival still holds its own in terms of the style from previous years: conceptual works remain the dominant force among the exhibits. Exhibitions such as Fight Hand to Hand in the Streets by Wu Chenghuan, displays the natural facial expressions of unsuspecting pedestrians on the street. While waiting at different Beijing locations, Wu grabs photos of strangers with almost guerilla-like tactics. Making sure to use the flash, even during the day, this sudden ambush-style often captures people surprised, even irritated, but their instant, instinctive reactions are what are the photographer is looking for. Through these photos of different people posing differently with the same irritated or terrified expressions, one sees they are not beautiful, and one doesn't feel happy or moved by any single photo (they're not even technically good photos) makes you suddenly understand how such abruptly taken photos actually capture the mindset of most people today. The exhibition also explores some daring themes, such as homosexuality. An exhibition by Lin Zhipeng called The Earthworm is prefaced with an allusive passage by the photographer: "Earthworms," he writes, "which are hermaphrodites, usually work at night, sleeping during daytime…like earthworms, our lives are filled with ambiguity, both love and hating distinctly, and in need of breaking [our] self-indulgence and pride." Such subject matter was not easy to get past the "supervision" of the government, but as Huang Yunqian, vice-mayor of Lianzhou, told the Global Times in an interview in late October, the government "doesn't want to interfere too much in the organization of the festival," which makes it different from other such events. Every single exhibition is meticulously organized, with each photographer given enough room to exhibit their works, which, for them, is the most important thing. Despite small details which still needed to be done before the opening, and the frequent misspelling or translation of the English captions on some pieces, there's no doubt that it's still one of the most mature and artistically driven photography festivals in China.